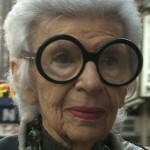 Iris Apfel’s massively oversized eyeglass frames say it all. 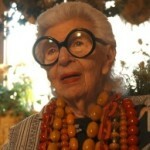 This 93-year-old fashion doyenne, a Virgo, has a really big eye for details. 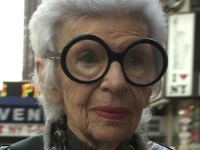 Iris, a documentary about her iconic style and shopping habits, directed by Albert Maysles and opening April 29, is a gateway into the Virgoan Sun’s personality. An earth sign, Virgo is extremely tactile, and to watch Apfel, born August 29, 1921, scrutinize potential bounty is like touching the merchandise yourself. In fact, the first frames of Iris show her adjusting her outsized amber beads which fall into her category of “things I’ve been collecting” and which, for her, “has to feel right.” But it’s the specificity that’s key here. She’s a whiz at provenance and is quick to get rid of, say, a garment’s collar so she can tailor it more to her liking, or wearing a Chinese shaman’s jacket as a cocktail outfit paired with skinny pants. “I like to improvise,” she says. Mercury, the god of the mind and intellect, rules Virgo, but Apfel’s choices are more about the gut rather than the thought. “It’s the process I like even more than wearing it,” she says about her strategy that determines whether an item is suitable for her style, as opposed to her grabbing something off the rack that has been reported as trending. In other words, getting dressed for the party often beats attending the gala. For Apfel, with four planets in Virgo, the critical eye is less about voicing displeasure about a fashion choice and more about addressing whether the garment is appropriate. Not everyone possesses this ability to critique a potential purchase: to ask whether it will enhance the wearer in a specific way, as opposed to allowing the wearer to be one of the crowd. 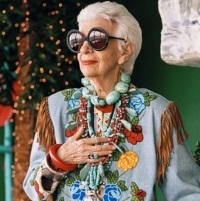 In Iris, Apfel goes on record to say she hates homogenization, but getting beyond wearing what everyone else does requires a true sense of one’s style. And Virgo, which is associated with the harvest, is particularly well adapted to analytically sorting out what’s hardy, unique and valuable from that which will simply not enhance one’s image or spirit. Birth charts, though, are not just about the Sun sign. Where, then, does Apfel – whose sign is the modest, humble, wanting-to-serve Virgo – get her proclivity for fashion drama and spectacle? Those mutant beads, which look as though they weigh more than Iris, could pass for shields. Those color combinations! The gestalt! Apfel does have her Mars – the ability to go after what she wants in life – in dramatic Leo, tied to visionary and artistic Neptune. It’s not a leap to view her outfits as garments-as-paintings. And most of her planets are in receptive signs, which makes just about any wearable item fair game for her treasure trove. “Everything I have I go out and find,” Apfel declares. She hunted. Seeing what wound up in her lair, we gathered.